Ken Sanders, a junior at West Side Leadership Academy in Gary, Ind., moved with his family from Chicago in 2013. Two of the six children in the Sanders family attend West Side Leadership Academy in Gary, Ind. 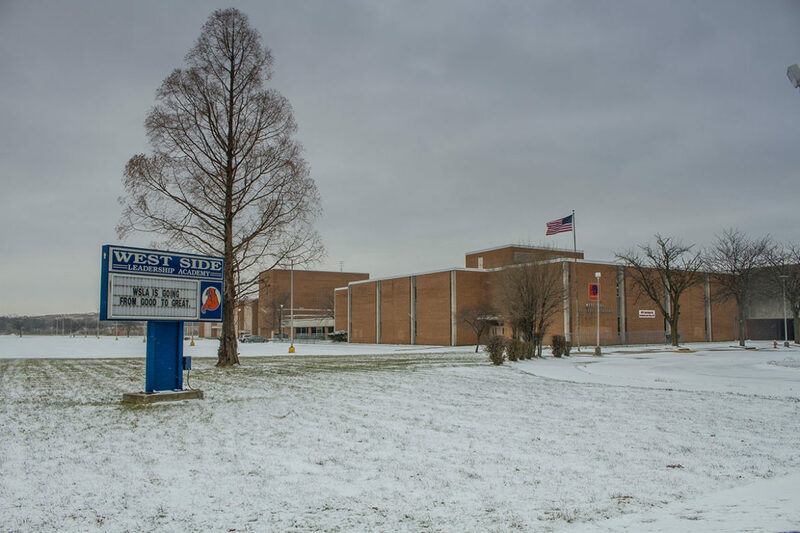 If a proposed closure is approved, West Side would become the only high school run by Gary’s public school district. Though Gary has its share of gun violence, the Sanders family feels safer in their new neighborhood than they did in Austin. It’s quiet and close to a local university and shopping. “You can just walk down the street and ain’t nobody going to mess with you,” Brittany said. Kenneth Sanders got a loan from a friend to purchase a cream-colored, single-family home for just over $13,000 — a deal after the previous owner foreclosed on the property. The house is much bigger than the family’s old Chicago apartment, where they used to hang a curtain in the living room to create an extra bedroom. Sanders started a business breeding German shepherds. On Facebook, he posts photos of his 12-year-old daughter, Yasheica, caring for the dogs. It’s a significant departure from how he earned money in Chicago, where he sold cocaine for years. His turning point came in 2010, while sitting in Cook County Jail following an arrest for possession of marijuana and a gun. But even though there’s a lot the Sanders family likes about Gary, they’ve seen the schools face significant challenges. For the first time in Indiana’s history, state education officials took over Gary’s public school district this year. The state-appointed emergency manager says Gary’s schools need to be cleaner, safer and more academically challenging. The budget crunch has manifested in large and small ways for students. Brittany carries hand sanitizer at school because the girl’s bathroom is often out of soap. Yasheica shares most of her textbooks with classmates because there aren’t enough. Brittany, Yasheica and their younger brother, Kentrel, had to transfer to an all-boys school when their elementary school’s old, faulty boiler broke and the school was shuttered for 17 months. The Sanders family hasn’t been able to escape school closures in Gary, which has shut down buildings and laid off teachers in recent years to save money. 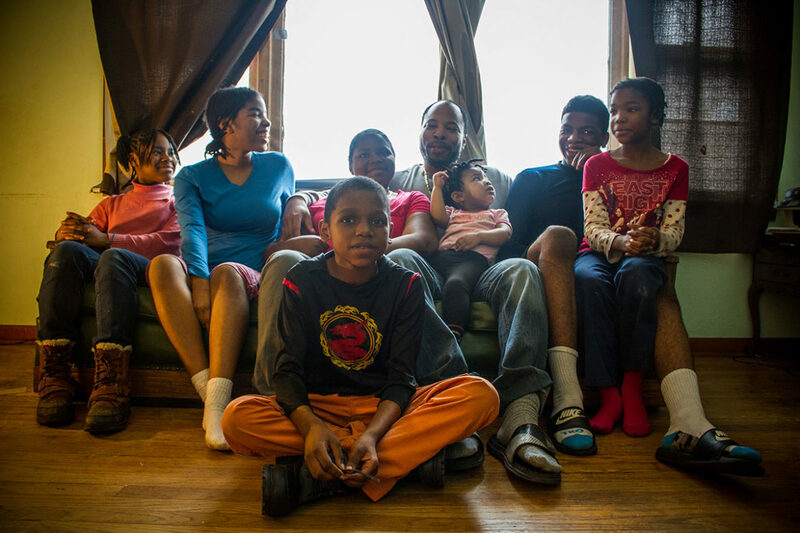 When Ken’s old middle school closed, Yasheica’s elementary school took in the displaced kids. Just recently, Gary’s emergency manager put a popular arts high school on the chopping block. Brittany and Ken’s principal says closing schools is a bigger deal in Chicago than Gary, because students in the smaller city often know one another before merging schools. But Brittany disagrees. She says it’s still disruptive for students. Brittany Sanders, 16, and her brother Ken Sanders, 17, get ready for school. Brittany Sanders, 16, and Ken Sanders, 17, walk to their bus stop before school. Brittany Sanders, 16, and Ken Sanders, 17, wait for their bus to West Side Leadership Academy. After finishing his work in a career prep class, Ken Sanders plays tic-tac-toe with his classmates Daniel Hamilton and Tayanna King at West Side Leadership Academy. Ken Sanders, 17, attends his JROTC class at West Side Leadership Academy. Brittany Sanders, 16, and her friend Aliyahna Turnage, 15, who also moved to Gary from Chicago, recently co-wrote a letter to their principal asking him to find a certified science teacher, instead of a long-term substitute, to teach their biology class. Brittany Sanders, 16, and Sharrod Bell, 16, are pictured outside after school at West Side Leadership Academy. Ken Sanders leaves West Side Leadership Academy for the day. Brittany Sanders, 16, and her youngest sister, Jada Sanders, 1, at their home in Gary, Ind. One day in October, Brittany and Ken rode the bus to West Side Leadership Academy, their nearly all-black high school. Brittany wore her long braids pulled into a ponytail and her school uniform: a navy blue shirt and khaki pants. Ken, who is tall with glasses, like his father, wore his crisp navy blue JROTC uniform with gold buttons. The siblings like some aspects of their high school, including the JROTC program, their friends, the sports programs and many supportive teachers. But they both see ways they aren’t being challenged. In his career prep class that day, Ken practiced his public speaking and wrote about the steps he needed to take to be a better leader. (“Being on time more,” was one). But after students finished their work, the teacher let them play tic-tac-toe for 20 minutes. “That gets boring sometimes,” Ken admits. Brittany and Ken have had a long-term substitute — one of dozens in the district — teaching their science classes. The sub sometimes passes class time by reading aloud long passages from the textbook. “She told us she’s learning right along with us,” Ken said. Brittany and Ken’s principal says the school advertised the opening for a science teacher but no one applied. It’s hard to attract top talent, he said, because Gary schools pay less than Chicago and other nearby districts. In the meantime, a veteran science teacher is helping the sub develop her lessons, though Brittany and Ken say the quality of instruction hasn’t improved. While Lettrice Sanders thinks Gary’s schools are worse than the ones in Chicago, Kenneth Sanders isn’t so sure. He says his 7-year-old daughter, Natalie, who started school in Gary, reads better than her siblings did at her age. “I regret not coming here earlier,” he says. But even though his oldest children are about to graduate, he hasn’t stopped looking for better school options. He knows exactly where the boundary for a higher-performing school district ends—just a few blocks from his house. If only he could afford to move there. 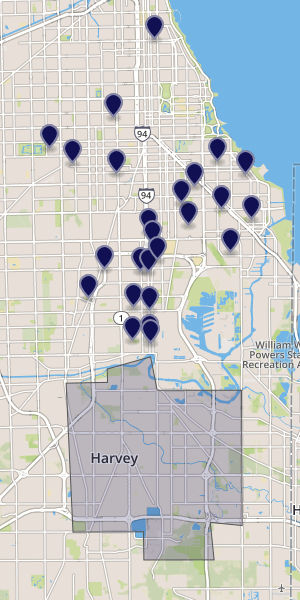 Chicago’s school system represents the perfect failings of public schools in America. the schools fail not because they are “public.” But rather because they are under funded. Private and charter schools can cherry pick students which leaves the children with high cost special needs in the public schools. It’s deliberate public policy– segregate and marginalize, build more private prisons and you’ll have a steady flow in and the investors get more dollars. There have been lots of stories about closing of CPS schools, mostly on west and south sides, but no one seems to connect the loss of the nearly 200,000 African Americans who have moved out of the city in the past decade as a huge factor in why there is clearly less need for schools given there are far less kids. This isn’t only a city issue as many districts have closed unneeded school buildings, including many in the suburbs where the numbers of kids overall continues to decline (overall, not EVERY location). The same is true for Catholic schools, while still a large number of parachiol schools, dozens have closed in all areas of city and suburbs.